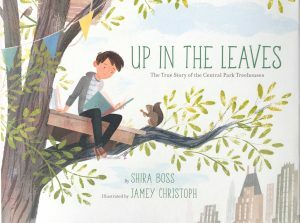 Jamey’s illustrations have appeared in The New York Times, San Francisco Chronicle, and in several award-winning children’s books, including Gordon Parks: How the Photographer Captured Black and White America and Up in the Leaves: The True Story of the Central Park Treehouses. An old soul at heart, his work draws inspiration from vintage advertising and travel posters and a lifelong curiosity of the past, particularly in the character of old buildings, cars, fashion, and music. He has received multiple recognitions from the Society of Illustrators, Communication Arts, and 3×3 Magazine. He works out of his 1920’s home in Cleveland Heights, OH with his crazy dogs, Owen and Jack.